Close Quarters Combat defined (wiki) Close Quarters Battle (CQB) or Close Quarters Combat (CQC) is a type of fighting in which small units engage the enemy with personal weapons at very short range, potentially to the point of hand-to-hand combat or fighting with hand weapons such as swords or knives. 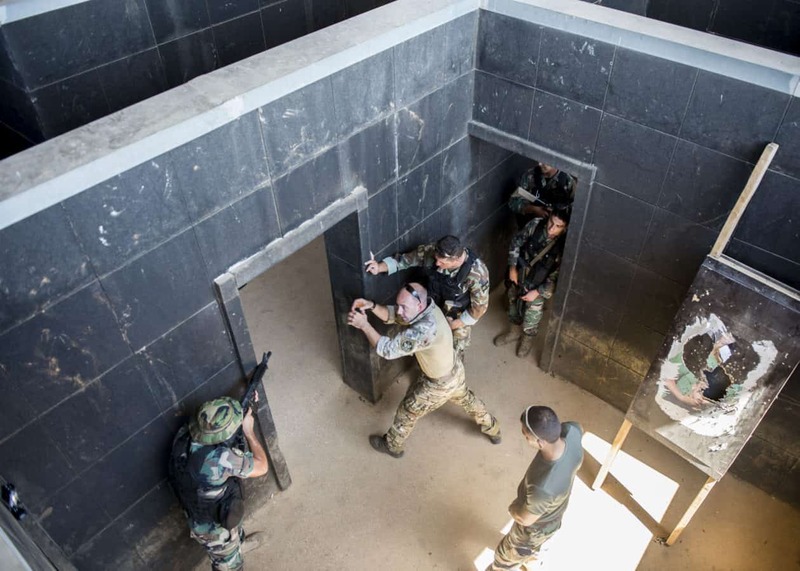 In the typical CQB scenario, the attackers try a very fast, violent takeover of a vehicle or structure controlled by the defenders, who usually have no easy way to withdraw. Because enemies, hostages/civilians, and fellow operators can be closely intermingled, CQB demands a rapid assault and a precise application of lethal force. The operators need great proficiency with their weapons, but also the ability to make split-second decisions in order to avoid or limit friendly casualties. CQB is defined as a short-duration, high-intensity conflict, characterized by sudden violence at close range. The following training method grafts some concepts of CQC with Physical Training to create high intensity training that pushes the body and the mind while teaching individuals to work together in an extreme environment. It’s not necessary to use an actual room for this training, although that would work nicely. In a gym or garage, setting up the room can be done by putting down a long piece of tape or drawing a line on the floor with chalk for the door (about 3 feet long). In each corner of the room, write a number on the floor. 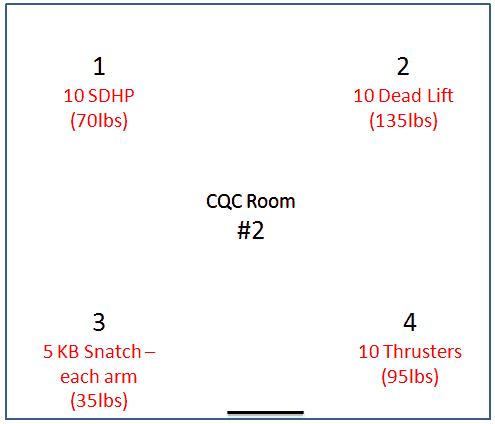 Here are a couple examples of setting up the exercises in a room. Room #1 is fairly simple and is great for getting started. Room #2 is much more difficult. An assault element of 4 individuals “stack” on the door. When the #4 man is in position he/she will initiate assault by squeezing the shoulder of the person in front of them, who passes on the squeeze until the #1 man gets the order to go. In the first 4 go-arounds, each person should get used to effectively entering the room and going to their position and executing the exercise. Each time the team will change positions – 1 becomes 2, 2 becomes 3, 3 becomes 4, and 4 becomes 1. In the crawl phase, the assault team practices entering efficiently and going directly to their position. When an individual completes all repetitions of their exercise they call call out “CLEAR”. When all members are done, #4 calls out “ALL CLEAR”. It is important in the Crawl phase to develop “muscle memory” by focusing intently on SOPs (Standard Operating Procedures). After each entry, talk about what what went right and what went wrong. When all members have developed coordinated efficiency in entering the room, properly executing exercises, and communicating with one another, it’s time to turn up the heat. Speed of entry and execution of exercises. Overwhelming presence – especially on entry. Pick up the pace of the entry. All members should be in place and executing movements in 3 seconds or less. When entering, the team should be yelling “Go! Go! Go!”, or Move! Move! Move!” The entry should be awesome. Similar to the Crawl, the team should run through this 4 times – changing positions each time. After running through the room with increased intensity, it’s time to add additional variables and time each run. Note that time starts when #1 breeches the door. Team enters the room as practiced, executes movements, and calls out “CLEAR!”. When all members are clear #4 calls out “ALL CLEAR – MOVE”. 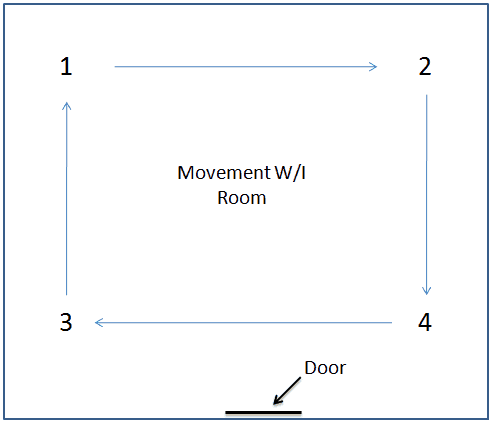 All members move clockwise around room until each person has executed all positions. Final “ALL CLEAR!” clears the room and stops time. 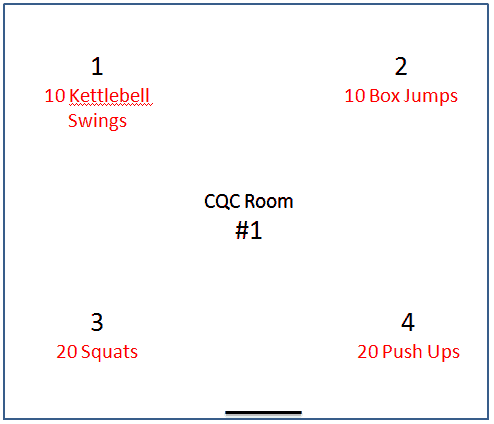 Set up 2 or more rooms next to each other and vary the exercises in the each room. 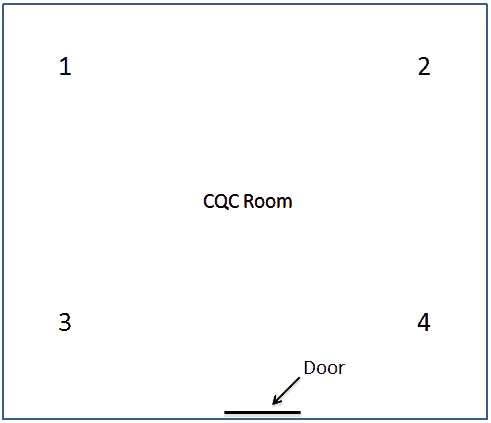 Enter room #1 and clear it as described in the above (movement within the room). When room is “ALL CLEAR”, team stacks on next door and #4 initiates squeeze. Go from room to room until all are “ALL CLEAR”. 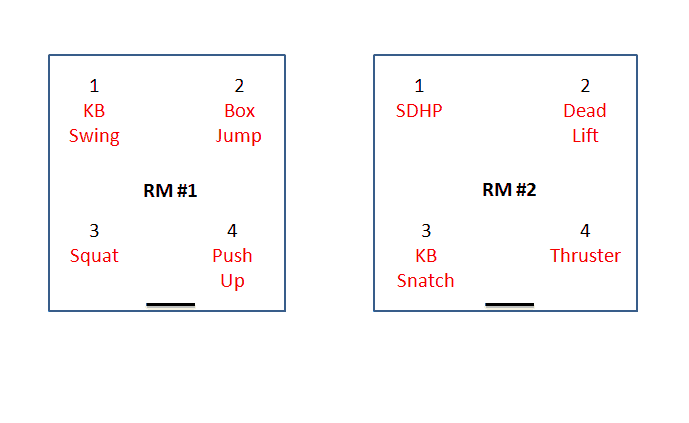 As with Crawl and Walk, each member of the team should practice each position by running through the scenarios 4 times, changing postions each time. 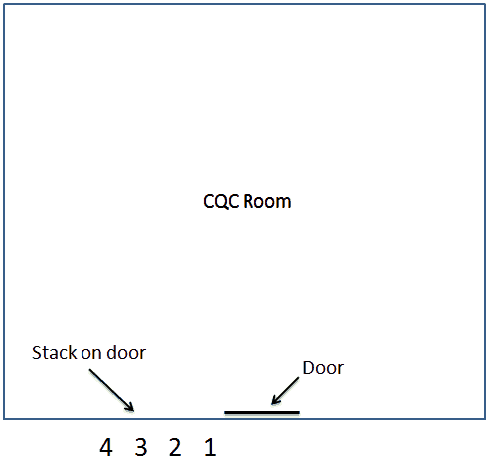 The importance of ACCURACY WITH INTENSITY cannot be overstated in CQC. For this reason it’s important to spend plenty of time in the Crawl and Walk phases. Don’t move ahead until you have it down pat. Communicate before during and after each assault. Talk about how you are going to execute, motivate and communicate during execution, and talk about what went right and what went wrong – and how you will fix it. In the Run phase, teams should be working like well oiled machines. Errors in Run phase should be penalized with remediation PT (200 Meter tire drag and 25 burpees). Full Mission Profiles are fictitious representations of possible real-world scenarios. This looks like a lot of fun and a great way to build comaraderie in the gym. Not to mention it works great on training the mind too. Thanks! Aw, this was a very quality post. In theory I’d like to write like this too – taking time and true work to make a good article… but what can I say… I procrastinate alot and by no means look to have a thing done.